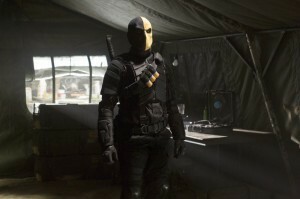 MANU BENNETT (“SPARTACUS”) GUEST STARS AS SLADE WILSON — After Oliver (Stephen Amell) is shot, he turns to a surprising person for help – Felicity (Emily Bett Rickards). Diggle (David Ramsey) is stunned when he sees Felicity walk through the front door of the lair dragging a dying Oliver behind her, and the two team up to save Oliver’s life. As Oliver (Stephen Amell) hovers between life and death, he flashes back to a seminal event on the island – a daring escape attempt with his new friend Slade Wilson (guest star Manu Bennett). Katie Cassidy, Willa Holland, Paul Blackthorne and Susanna Thompson also star. John Behring directed the episode with story by Greg Berlanti & Andrew Kreisberg and teleplay by Andrew Kreisberg and Marc Guggenheim (#114). Read more spoilers on our Arrow spoilers page!